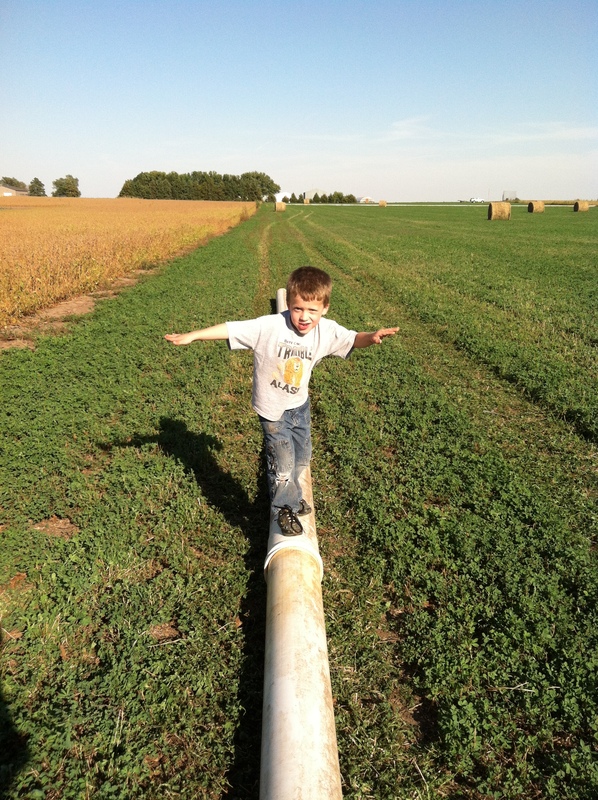 If you’ll recall, we were moving pipe to the pumpkins and fall broccoli last week. Everything under this irrigation is looking good. The broccoli is getting bigger and tasting delicious. We also have a beautiful selection of pumpkins and squash for decoration – and more importantly, EATING! So let’s talk about this week’s squash selection. 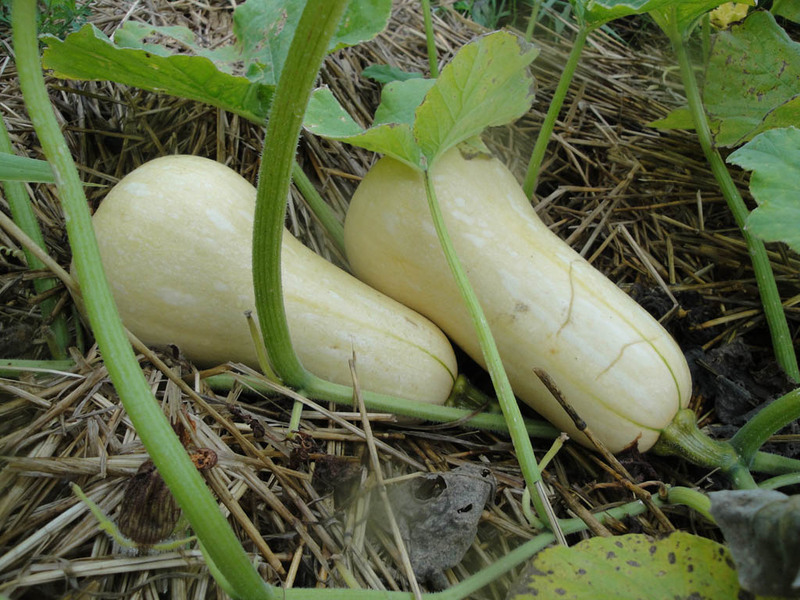 Butternut, the classic winter squash, has a peachy skin and bright orange flesh. 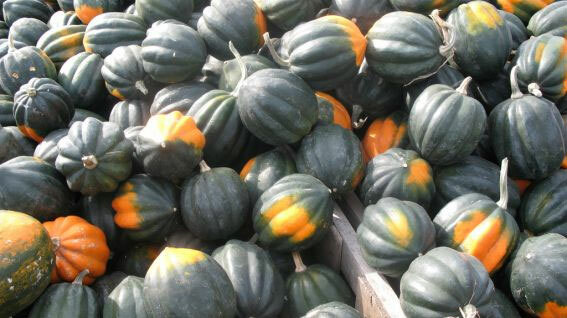 Acorn squash is dark green with deep ridges and a golden yellow flesh. 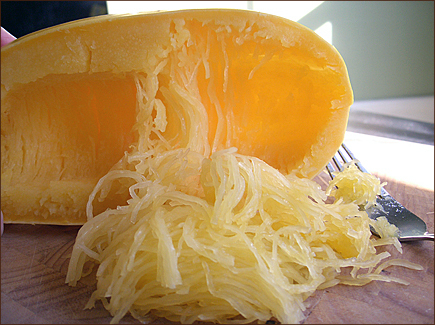 Spaghetti squash has a fibrous creamy white flesh which resembles spaghetti when cooked. 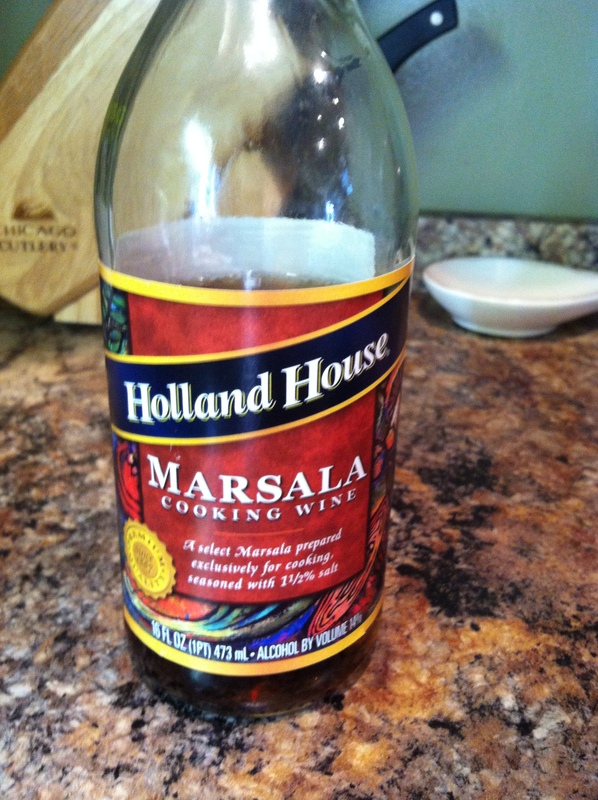 It’s not sweet and can be eaten just as you would spaghetti – with sauces and cheese! So how do you cook these? 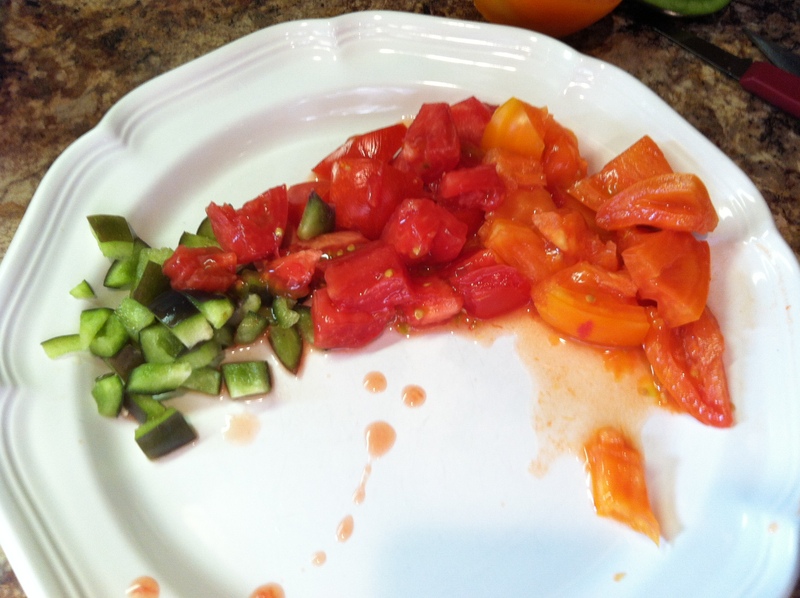 The simplest way is to cut the squash in half and scrape out the seed and stringy parts. 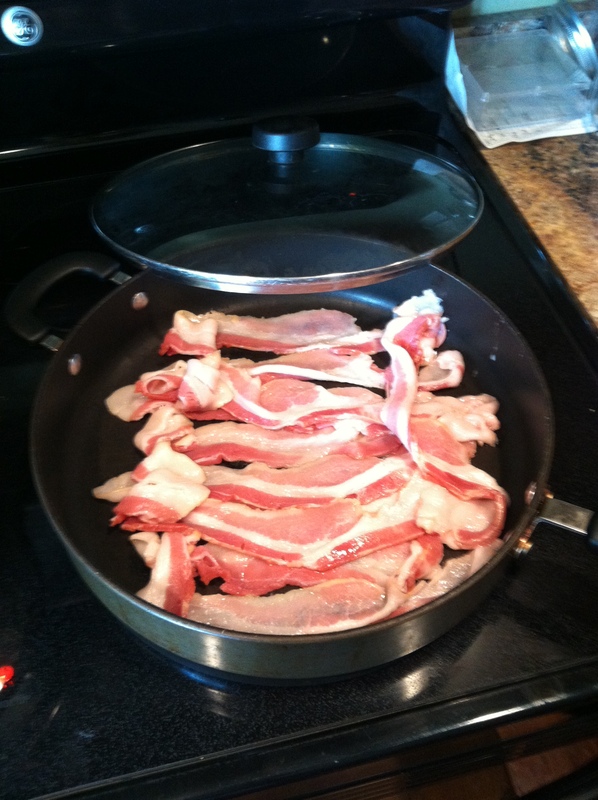 Put the pieces cut side down in a pan with ½ inch water. Bake at 400 oF for 1 hour or until a fork easily pokes through the skin. Be sure to check out this week’s recipe. 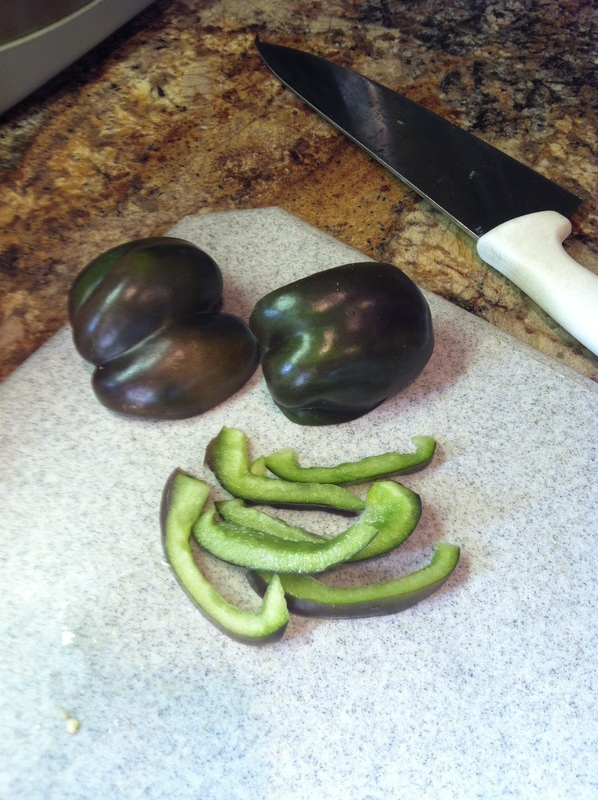 If you have a recipe to share, email it to pekareksproduce@hotmail.com or include it in the comments section. With harvest going in full swing, it seems like the time of year when we should begin picking up pipe and storing it for next year –but that just ain’t the case. 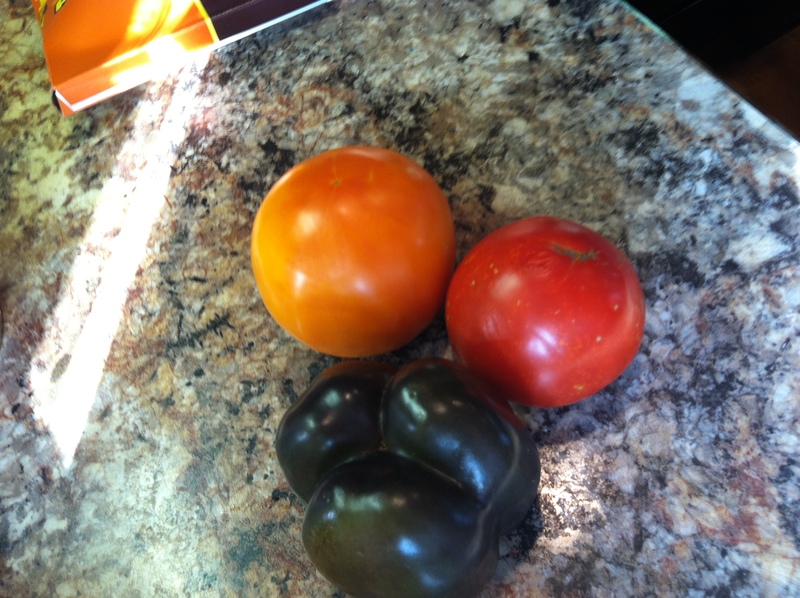 Most of our vegetables are drip irrigated with groundwater. However, the pumpkins and fall broccoli are irrigated by sprinkler pipe from surface water. Unfortunately, because it has been such a dry year, the water level in the pond has dropped drastically. 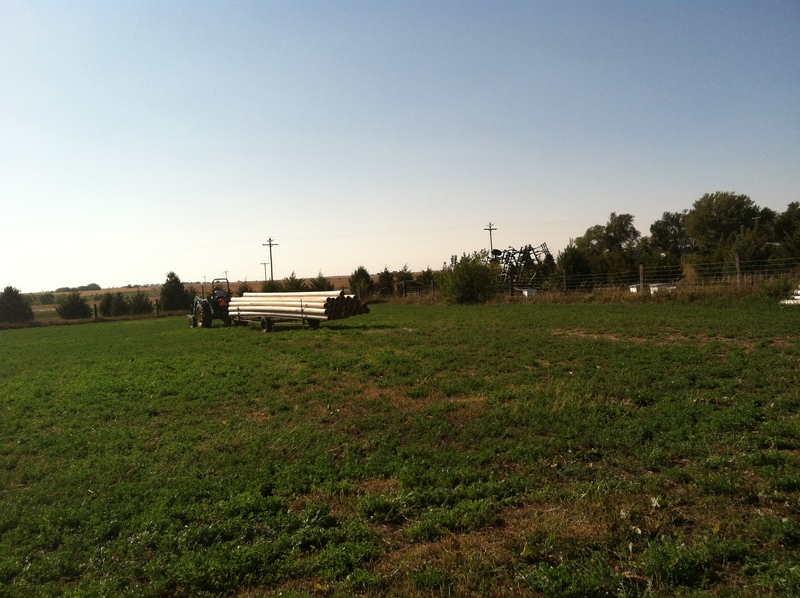 So this week, we moved pipe and began irrigating off of the other well on the farm. 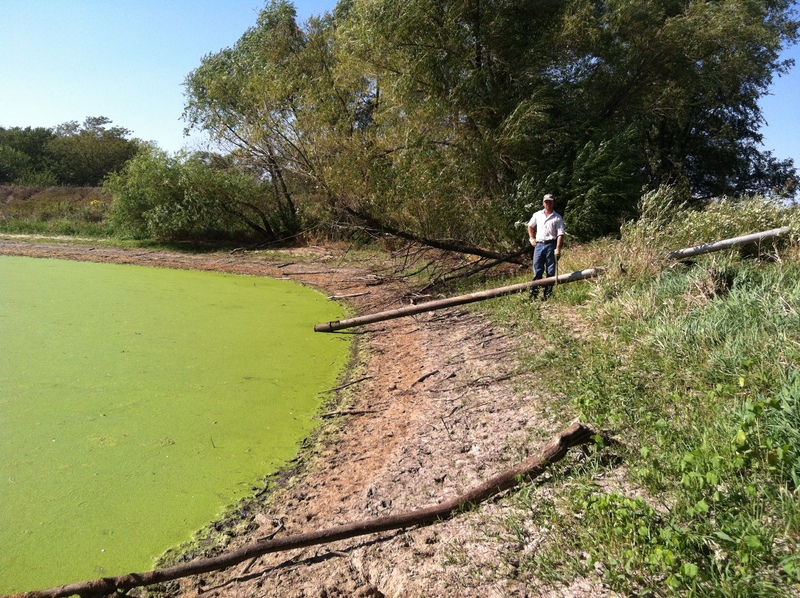 In this picture, Ryan is standing at the water level in the spring. The farm is still busy and humming along. 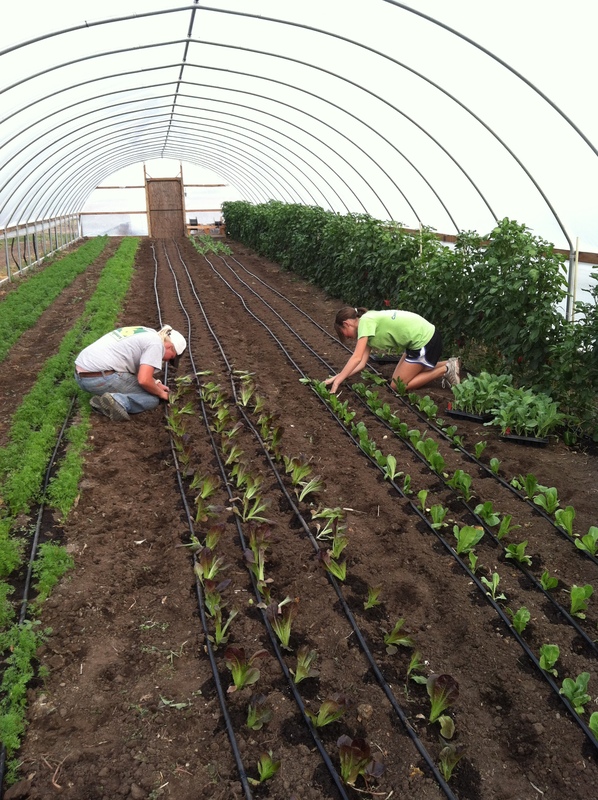 Last week Ryan and the girls transplanted lettuce and spinach in the high tunnel, so get ready for the fall crop. Does it feel like fall yet? Although we are still seeing several days with temperatures in the 90s, the evenings are beginning to cool off and the crops are suggesting that it is time for fall. 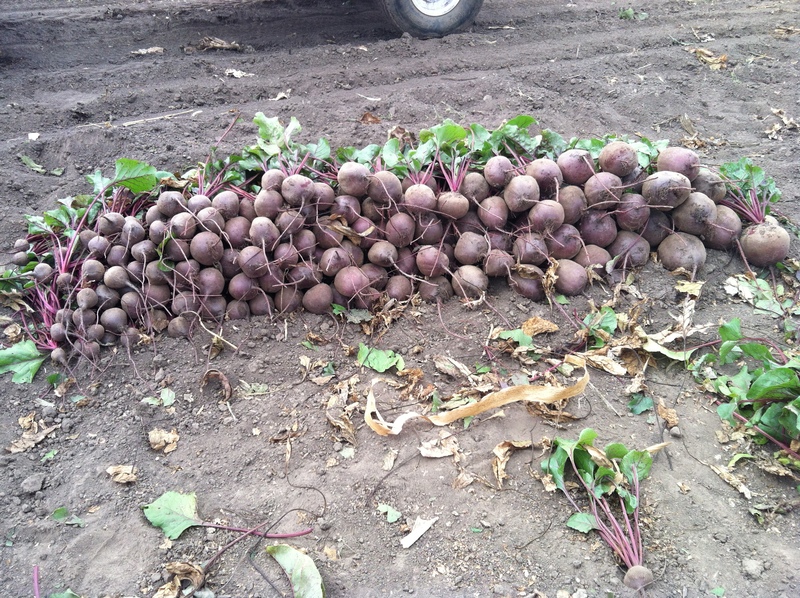 The sweet corn is finished for the year and I pulled the last of the beets this week. There are no more broccoli transplants and the only thing left to put in the ground are the lettuce and kohlrabi growing in the cold frames. 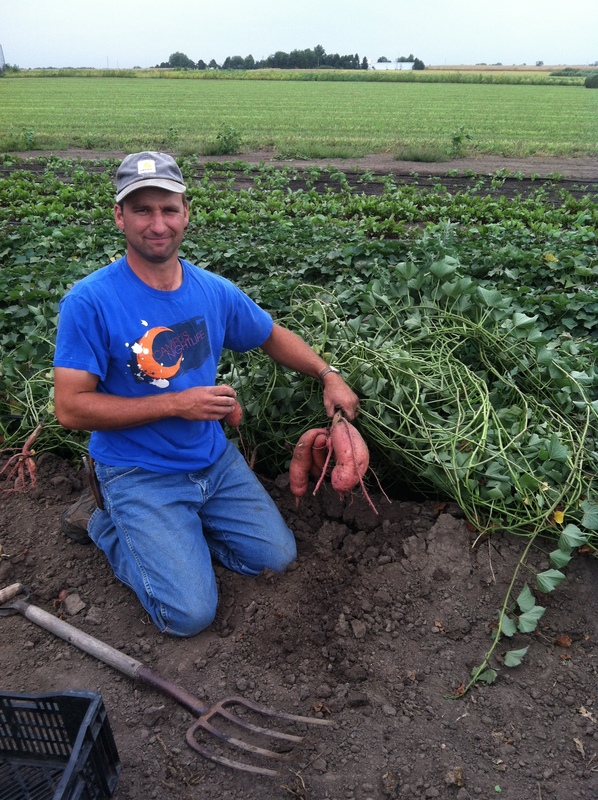 We often think of sweet potatoes as something grown and eaten in the south. But we have been trying to grow these babies for the last couple years and have had some success this year. Sweet potatoes are packed full of nutrition. They are full of beta-carotene (vitamin A) and a good source of vitamin C, fiber, and manganese, with additional nutrients like potassium, iron copper and vitamin B6. 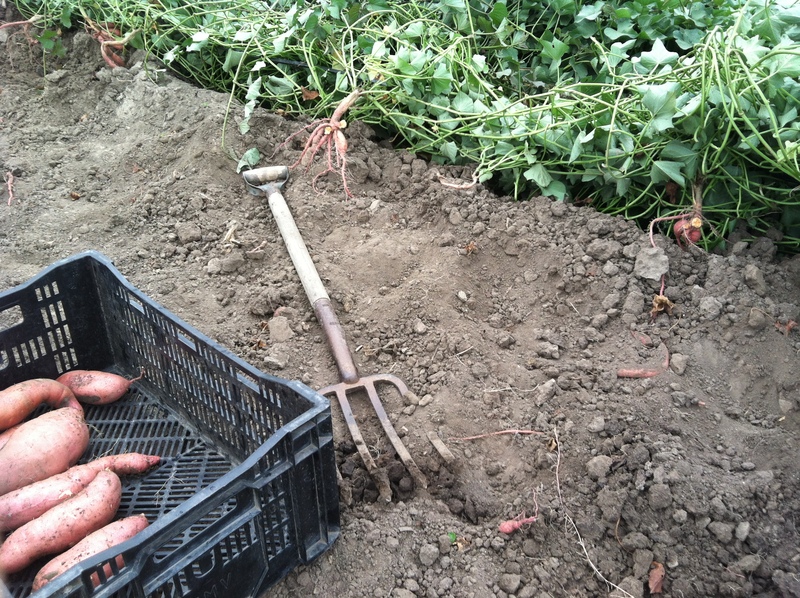 So how do we dig so many sweet potatoes? With a pitch fork of course! 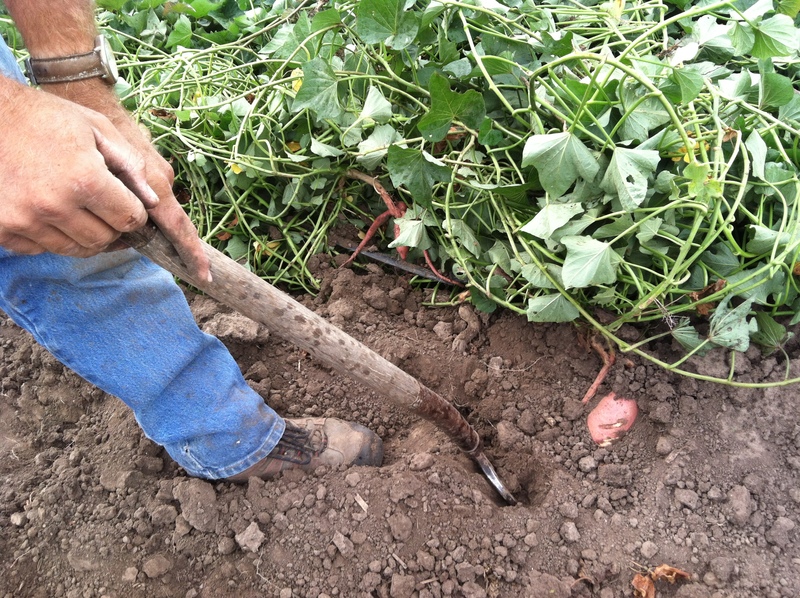 Sometimes our techniques for harvesting large amounts of crop are technical and advanced – other times, the job just calls for a pitch fork! For those of you that have not heard – sweet potatoes are a dearly loved vegetable in my house. 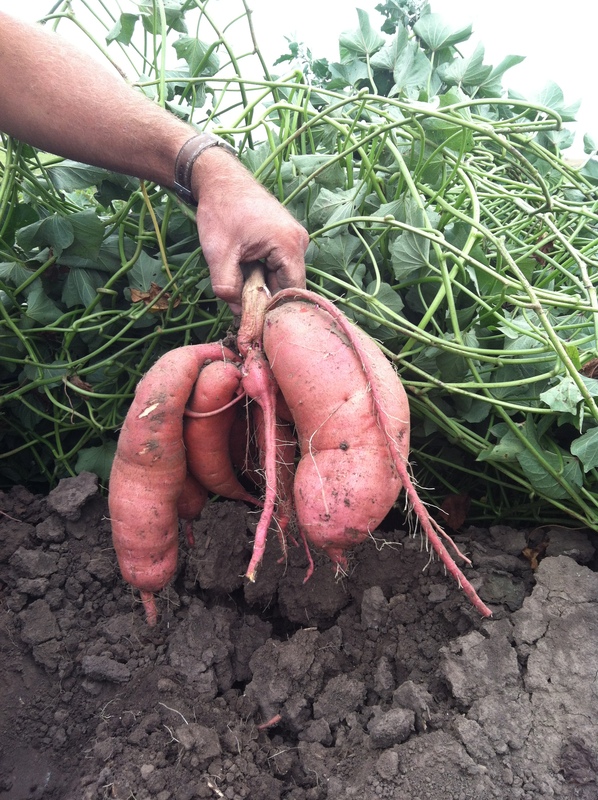 These babies are chocked full of beta-carotene (vitamin A) and a good source of vitamin C, fiber, and manganese. they also have a good deal of potassium, iron, copper and vitamin B6. My absolute favorite way to eat this is as a Sweet Potato Fry! 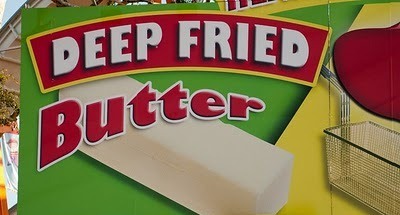 We all know you can fry almost anything – they do it at the fair! There’s fried oreos, fried butter, and fried coke… but I really don’t like to fry things. It just seems like a good way to take a perfectly healthy vegetable and make it bad for you. 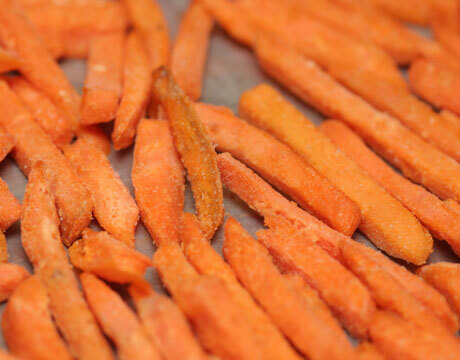 So, here is a tasty sweet potato fries recipe that uses your oven. Sprinkle them with salt and pepper. Try them dipped in butter, bleu cheese dressing or ketchup. Preheat a oven to 425 degrees Farenheit. Slice sweet potatoes like steak fries. I like to use my apple slicer to speed up the process. 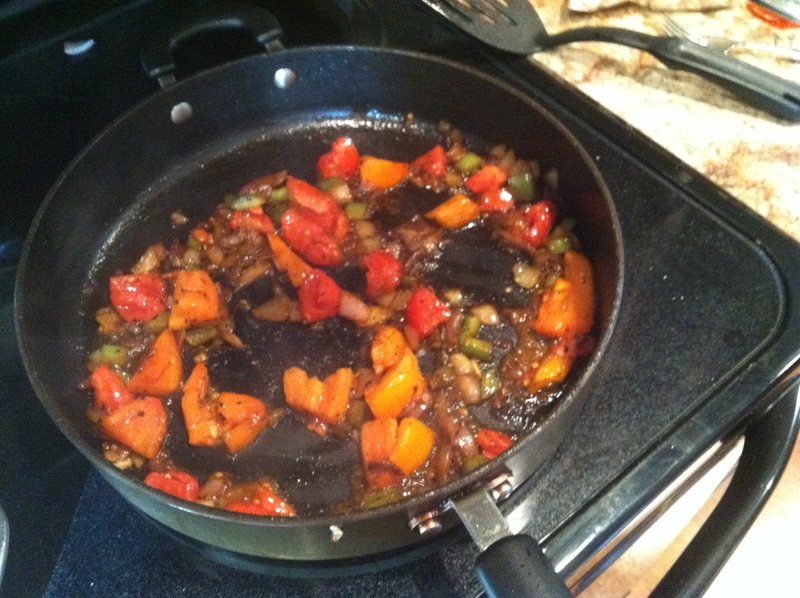 In a large mixing bowl, mix the oil and sweet potatoes. 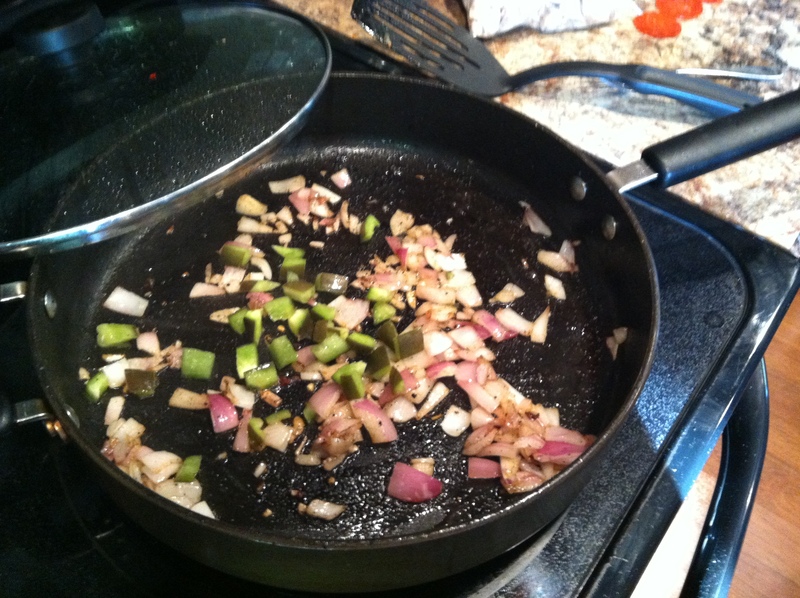 Add seasonings remaining ingredients and toss again to coat evenly. Place the seasoned sweet potato fries in one even layer onto a metal baking sheet. (I cover my baking sheet with aluminum foil for easy clean up. 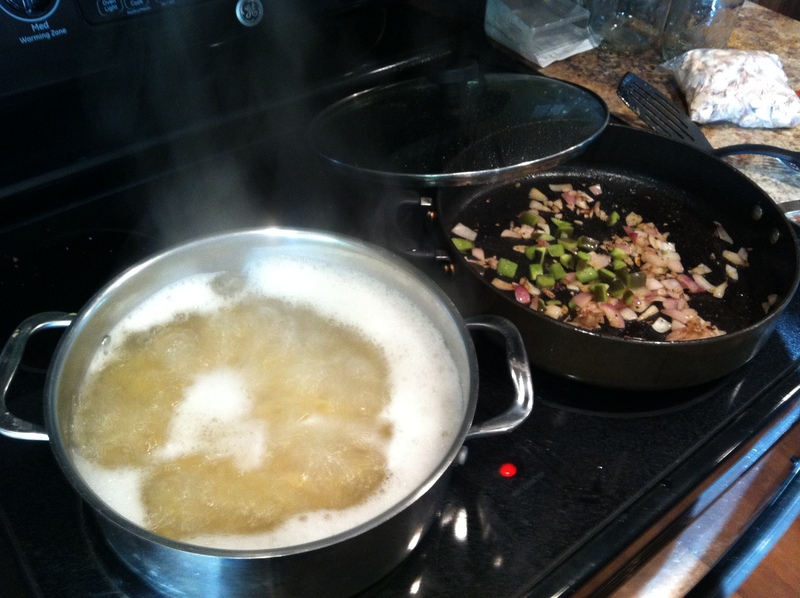 Maintain a space between each fry so they get crispy on all sides. 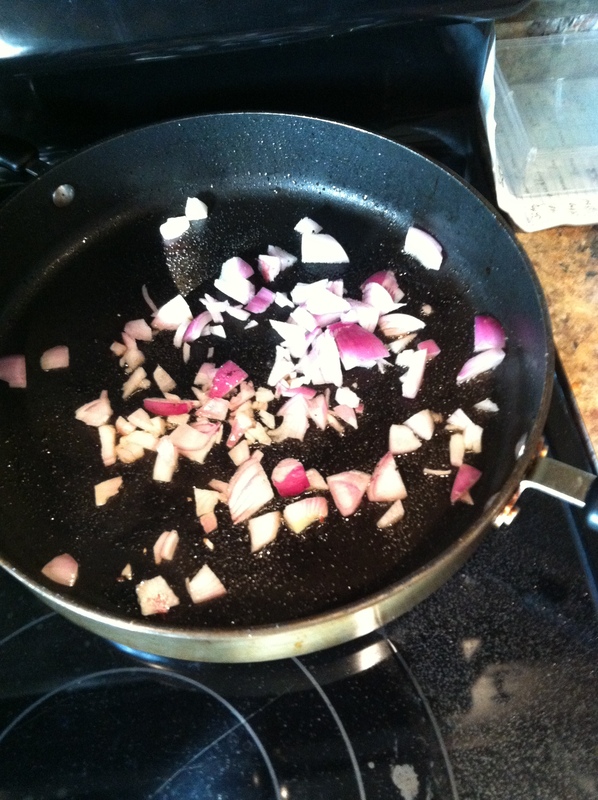 Avoid overlapping the fries by baking them in smaller batches. Place the fries into the oven and cook for about ten minutes. Remove the tray from the oven and flip the fries over with a spatula or tongs, then place the tray back in the oven for another ten minutes. Ideally, the fries should be soft on the inside and browned on the outside. Let the fries cool for about five minutes before serving. 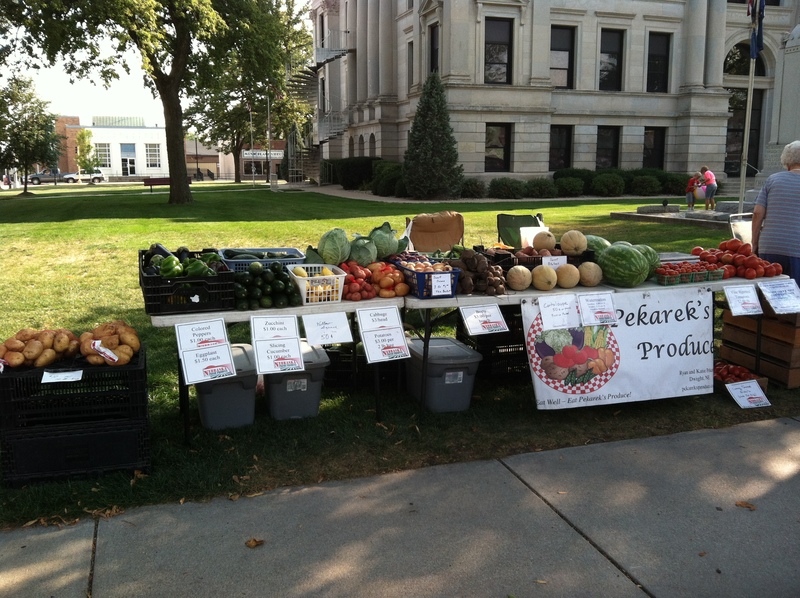 As many of you know, Wednesdays are a great day for us at Pekarek’s Produce. 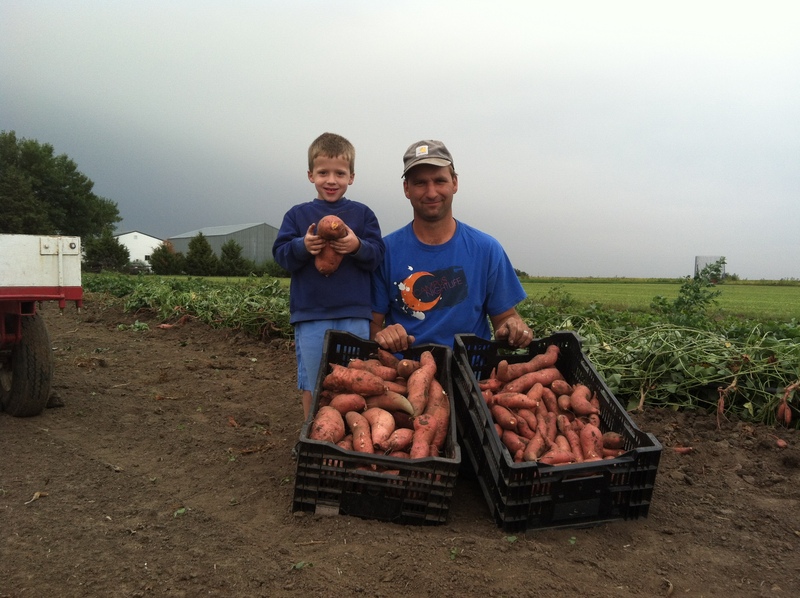 Not only do we get to deliver your weekly CSA bag, but we also get to do the Seward Farmer’s Market. Seward has always been the “home game” for us and every Wednesday you can see Ryan, the kids and me! Activities on the farm keep chugging away. We are done seeding and transplanting for the year, except for some lettuce that is in the cold frames, so hopefully that will allow us to slow down a bit. The tomatoes have unfortunately slowed down right now. Its amazing they’ve produced like they did given this year’s weather. We are now picking on a new patch of water melon and cantaloupe that are ripening, so we should have those for some time yet. Our sweet corn is officially done for the year. 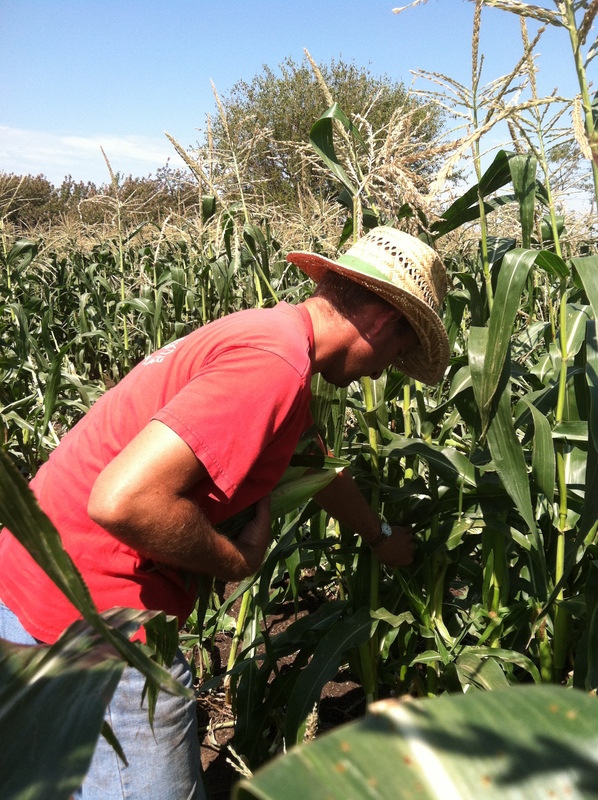 This last batch of corn never saw rain, so the roots were very shallow – when the wind blew, so did the corn. It twisted this way and that and layed down, so Ryan and I spent a hot and twisty day picking corn that was half on the ground. Fun!! Luckily we were able to run drip tape on the plants right away, so they are looking pretty good today!